Outsourcing will not only help in digitizing your data, but also ensure systematic storage and management of your data across multiple platforms, so that it becomes more logical, indexed, helpful, and readily available for analysis when you need to take crucial decisions. Our team of data management executives is well-trained and highly experienced. We also have a sizeable team in place and can turn around large volumes of work within short turnaround time without compromising on quality. The most natural benefit that outsourcers get is the time difference factor. It is like we are working for you the whole night and delivering you what you asked for the first thing in the morning. O2I offers skilled resources who have worked on thousands of data entry assignments. They know the best practices and processes that need to be followed to achieve maximum quality. We pride ourselves on turning around work with greater than 98% accuracy for all the data management projects that we undertake. All outputs are first validated by computer and then manually rechecked. Our team uses double-monitors which increases speed and reduces errors. Read more about Outsource2india's data security policy. O2I offers clients with a unique advantage of paying only for the amount of work done, with the additional flexibility of providing ready resources during heavy workloads. So, you don't have to pay for a full-time resource, when you just need five hours of work per day. Plus, you can seamlessly ramp-up the team when the need comes. The lesser important works like data entry, if not assigned to your regular employees will make them feel more important and valued as a skilled resource. This will help them deliver core and productive business tasks with more fun, passion, and dedication. You as an outsourcer will be ushering the global work distribution culture. This is phenomenal for the overall augmentation of global workforce. Not only you get the benefits but you also become the primary link for this global growth story. We just cannot get away without mentioning this. 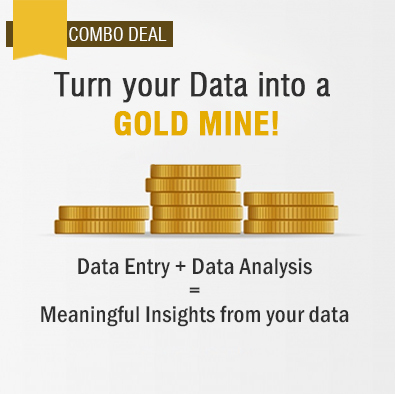 You can save more than 60% of the cost of getting data entry projects done in-house. Save cost on infrastructure and set-up. Data entry work typically needs a large work force and large office spaces. Outsourcing data management services offshore will free up real estate for critical processes that you need to conduct in-house. Starting a partnership with a new vendor can be a difficult step. We offer free trials on our services. Give us a small project and test the quality of work, turnaround time, and customer support. Fill out this form to request a FREE TRIAL.